Less than one-fourth of all breast lumps are found to be cancerous, but benign breast disease can be difficult to distinguish from cancer. 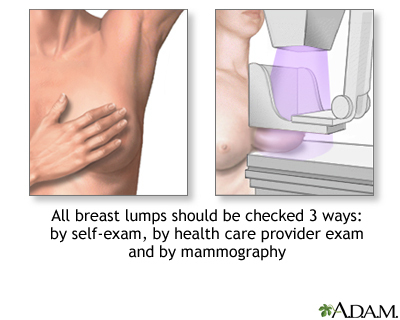 Consequently, all breast lumps should be checked by a health care professional. Reviewed By: Mary C. Mancini, MD, PhD, Department of Surgery, Louisiana State University Health Sciences Center-Shreveport, Shreveport, Louisiana. Review provided by VeriMed Healthcare Network. Also reviewed by David Zieve, MD, MHA, Medical Director, Brenda Conaway, Editorial Director, and the A.D.A.M. Editorial team.